Defense Secretary: Turkey's Turmoil Shouldn't Harm Battle Against ISIS Defense Secretary Ash Carter said the U.S. was surprised by the attempted coup in Turkey, but he does not expect it to affect the campaign against the Islamic State. 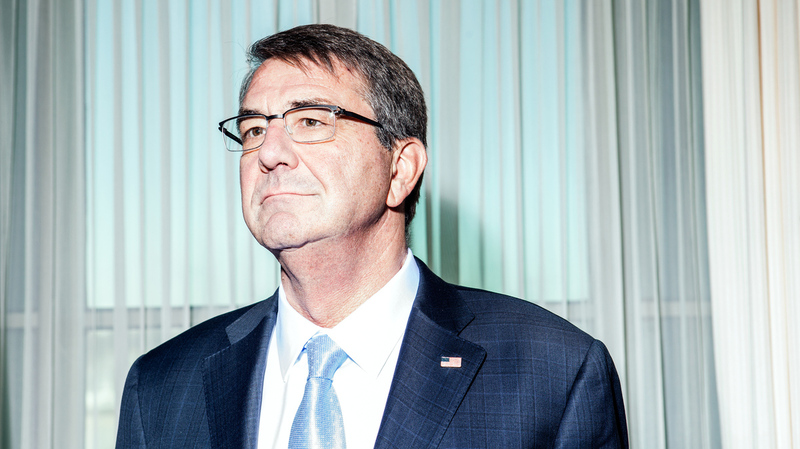 Defense Secretary Ash Carter, shown here at his Pentagon office in February, said the attempted coup in Turkey last week caught everyone by surprise. But he does not believe it will harm the battle against the Islamic State in Syria. The U.S. uses an air base in Turkey to launch strikes against ISIS. Defense Secretary Ash Carter is hosting a meeting this week with his counterparts from other nations in the coalition against the Islamic State. The gathering comes at a particularly turbulent time. Turkey, a key member in that coalition, is still reeling from an unexpected coup attempt. Meanwhile, ISIS appears to be on the defensive, having steadily lost territory over the past year or so. Renee Montagne: I'd like to start with Turkey. It has just put down a coup led by a sizable number of its military leaders, allegedly. A sizable number have been rounded up. At this time Turkey has just recently seriously committed to the coalition fighting ISIS. How much of a problem for the fight against ISIS is this situation with the coup in Turkey? Ash Carter: Well, we didn't know this was coming and so it did come as a surprise to us, but I don't think it's going to affect our campaign against ISIL. And, in fact, I spoke to my Turkish counterpart earlier today [Tuesday] and he told me as much. As far as we know, the entire military wasn't involved. This was a faction or a group within the military. And the Turkish military is a very large, very professional organization. They are a NATO ally, we've worked with them for decades and I expect our relationship there to continue. And your counterpart. Is there anything you can tell us about what he said specifically? Yes. No, he simply said that they had gained control of events there. He was very pleased to hear from me. He and I have a good relationship. And I told him I was very glad to hear of his safety. Well, talk about attacks in other parts of the world. Obviously, Western Europe. We've seen some terrible attacks in France, in Brussels. How much of this is being directed out of Raqqa? You talk about defeating ISIS. You've got to talk about some, a real place. It's Raqqa, Syria. And also the city of Mosul. Well, the plan will be to take Raqqa away from them and make sure that there isn't any ISIL planning done there. It's important to show that there cannot be and will not be an Islamic State based upon this ideology. In answer to your question about inspiration or direction, you see both. Sometimes you see direction of attacks in other countries coming out of Raqqa or Mosul. Sometimes it's just the inspiration. It's just the idea that there's this thing called this Islamic State. But either way, it's important that we destroy the fact of and the idea of an Islamic State. Secretary of State John Kerry is working with the Russians to help coordinate air strikes in Syria against ISIS and a Syrian al-Qaida affiliate as well, the Nusra Front. Russia came into the conflict on the side of the Assad regime. If the Pentagon coordinates air strikes with the Russians, would this not help Bashar al-Assad stay in power? Well, that's not in the cards at the moment. What we're discussing with the Russians is the possibility, which still only remains a possibility, that they will begin to do, in fact, what they said they were going to do when they first intervened in Syria. What they said they were going to do was promote a transition away from Assad, and therefore toward the end of the civil war which started this whole thing. Then they said they were going to fight the terrorists, but that's not what they've done. They've instead propped up Assad in fighting the moderate opposition. Well we'd always, we have our differences with Russia, and obviously Syria is one, Ukraine is another. At the same time, we stand ready to work with Russia as with others around the world where our interests coincide and overlap. So, for example, the Russians worked with us on the Iranian nuclear deal. They've worked [with] us in some aspects of non-proliferation affecting North Korea. So there are areas where we've found it's possible. But up to now, in Syria – and we'll see about the future — they have been more intent on operating in ways that are not consistent with our interests than in ways consistent with our interests. So, we'll see what the future holds. President Obama aimed from day one to leave office with no American troops in Afghanistan. He thought it was the good war, he said we could do good things there, but we're going to be out. Several dates came and went and now he has agreed to leave 8,500 troops through 2017. For most people, most Americans haven't thought of the war that much. What can that mean, how valuable can that be? Well, it is a much smaller number than used to be there, and that is because our role there now is to assist the Afghan security forces. Remember, there was no Afghan army, there was no Afghan air force. There was nothing. We laboriously built up the Afghan [National] Security Forces and now they're capable of fighting largely on their own, but not entirely on their own. So we're helping them. So that's what the American presence there is for. And you're right, the president has constantly assessed and adjusted what we're doing there in consideration of the conditions. So if you like, he took out a little extra insurance policy on the success of the Afghan Security Forces and therefore asked us to make some adjustments. But in the military sense, it's mostly in the hands of the Afghan Security Forces now, and as you know from years, the past, they are today a capable force. They were nothing a few years ago. Likely to see thousands of American troops there for some years to come? Oh, I think probably future presidents will continue to adjust that and I think as the Afghan Security Forces get stronger and the Taliban and other forces get weaker or more dispirited, that not just the U.S. but the other international presence there can go down. I think we'll always want to keep a close eye on counterterrorism in South Asia. That will probably be an enduring interest to the United States for quite some time.